To son Thomas, at twenty-two, four quarters of barley and a cow. To daughter Margery, at same age, eight comb of barley and a cow. To Robert, "my servant", eight bushels of barley. To each of my god-children, 12d. Wife, Agnes, and Thomas Fuller, "my father- in-law", to be executors. III. THOMAS SHERMAN, Gent., son of John and Agnes (Fuller) Sherman; born about 1490, at Yaxley, co. Suffolk; died, 1551, at Yaxley; married Jane Waller, daughter of John and Margaret (Thorolde) Waller of Wortham, co. Suffolk. She survived him and married, secondly, ___Gardiner, as whose widow she died, 1572-73.
i. Thomas (IV), buried, Sept. 17, 1585, Yaxley; m. (l) Elizabeth Yaxley; m. (2) Barbara Wheatcroft. ii. Richard, buried, Mch. 28, 1587, Diss; m. Margaret (Lane?). iv. Henry, m. (1) Agnes (Butter? ); m (2) Maryan (Smyth) Willson; m. (3) Margery _____. v. William, buried, June 1, 1583, Ipswich; m. Faith Lanye. vi, Robert, (? ); not named in wills. vii. Anthony, buried Sept. 7, 1582, Roydon; m, Mary Guydat. x. James, died, 1577, Yaxley; m. Margery, who survived him and married, secondly. Gyles Poolye, "Vycare of Yaxleye". The last four children were minors, under twenty-two years of age, in 1551. Thomas Sherman was an attorney at law with a large practice in the Court of Common Pleas. He was lord of several manors; churchwarden of Yaxley, and Deputy Sheriff in 1540 and 1546. The court records show that he was a great litigant himself and that Jane, his wife, "When occasion offered, was able to do her share of any fighting. In Star Chamber Proceedings is a bill of complaint of Sir John Wiseman, Knight, against Thomas Sherman of Yaxley, stating that on 22 April, 22 Henry VIII (1530), complainant sent two of his servants to distrain for unpaid rent of an acre of land in Gors Close, co. Suffolk, part of the manor of Swattyshall owned by complainant, which rent Sherman had refused to pay for three years; that said servants seized by way of distress a plow with four horses; and that as they were driving in the King’s highway, Johanne Sherman and Margery Hege, with staves in their hands, and certain other riotous persons "made a sawte and fray upon the said ij servants & put them in daunger of their lyvis and grevously did bete William Erysshe & take away the said distress from them". 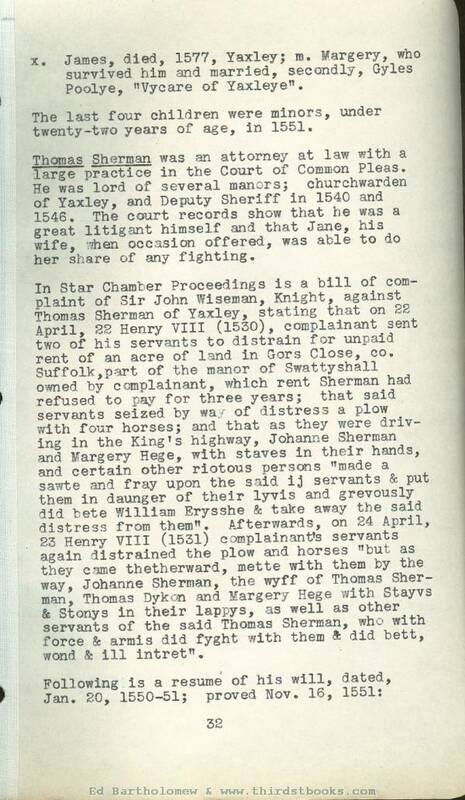 Afterwards, on 24 April, 23 Henry VIII (1531) complainants servants again distrained the plow and horses "but as they came thetherward, mette with them by the way, Johanne Sherman, the wyff of Thomas Sherman, Thomas Dykon .and Margery Hege with Stayvs & Stonys in their lappys, as well as other servants of the said Thomas Sherman, who with force & armis did fyght with them & did bett, wond & ill intret". Desires to be burled in the church of Yaxley, and gives to the high altar of said church, 3s.4d. To the poor of Yaxley, 6s.8d. ; the poor of Eye, 10s. ; the poor of Thrandeston, Burgate, Diss and Roydon, 3s.4d. To wife, Jane, houses and lands in Yaxley and Eye; wheat and malt; and live stock; house- hold goods; silver, etc. If she remarry, then to son Thomas. To son Thomas, silver; a gelding and four horses. To son Richard, "twenty markes over and be- sides all such moneye as I have given hym or lent hym, which is 50 pounds. To son Henry, 40 pounds, "when he cometh out of his prentyshode". To son William, 40 pounds, same condition. To son, Anthony, 40 pounds, at twenty-two years. To son Francis, lands in Dysse, late bought of John Waren; also all lands in Breseworth, co. Suffolk, at twenty-two years. 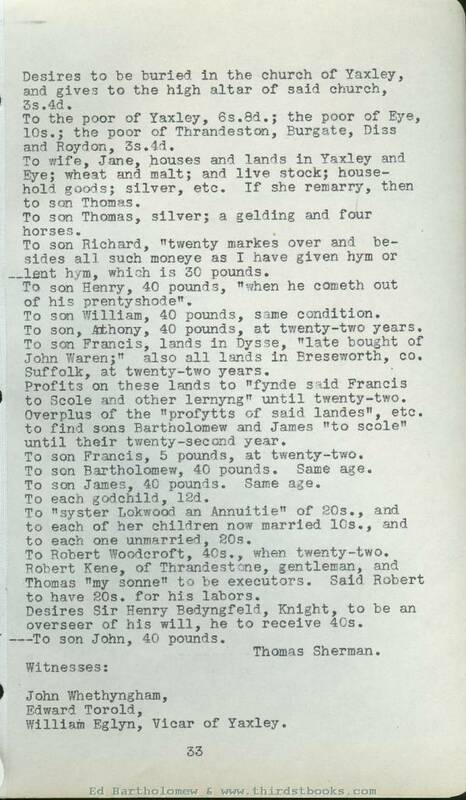 Profits on these lands to "fynde said Francis to Scole and other lernyng" until twenty-two. Overplus of the "profytts of said landes", etc. to find sons Bartholomew and James "to scole" until their twenty-second year. 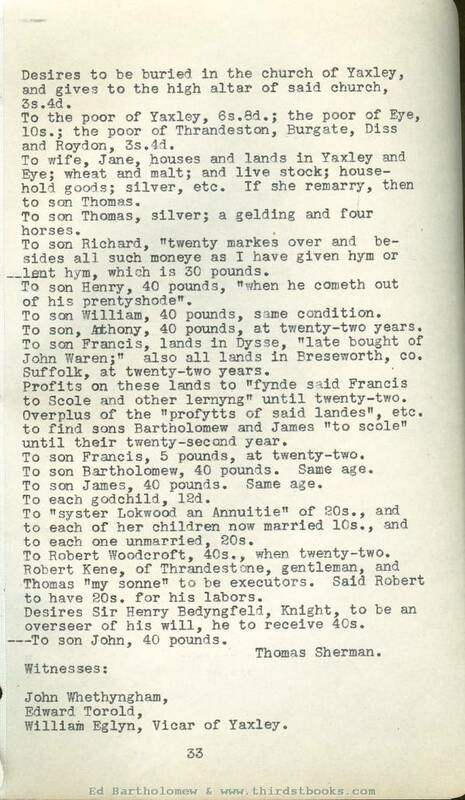 To son Francis, 5 pounds, at twenty-two. To son Bartholomew, 40 pounds. Same age. To son James, 40 pounds. Same age. To "syster Lokwood an Annuitie" of 20s., and to each of her children now married 10s., and to each one unmarried, 2Os. To Robert Woodcroft, 40s., when twenty-two. Robert Kene, of Thrandestone, gentleman, and Thomas "my sonne" to be executors. Said Robert to have 2Os. for his labors. Desires Sir Henry Bedyngfeld, Knight, to be an overseer of his will, he to receive 40s. —To son John, 40 pounds. William Eglyn, Vicar of Yaxley. To be buried in the church of Yaxley by my late husband Thomas Sherman. To the poor of Yaxley, 20s; the poor of Boy- don, 5s. ; the poor of Stokeaishe, 5s. To son Anthony Sherman, 80 pounds, with bed and bedsteads, and four kine. To son Henry Sherman, 20 pounds. To son James Sherman, 2O pounds, and the bed that I now lie upon. To son Anthony, one silver salt parcel and six silver spoons. The 2O pounds each, to Anthony, Henry and James to be paid by eldest son Thomas Sherman, "parcell of five score pounds wch he oweth me". To William, Robert, Bettrice, Margaret and Marie Sherman, sones and daughters of Anthony Sherman, and unto Brigett and Marie Sherman, daughters of James Sherman, sixty pounds, at twenty years of age. To be paid by my executors whereof Thomas Sherman my eldest seal oweth me forty pounds and Richard Sherman twenty pounds and odde money. Silver spoons to children of Anthony Sherman. To sons James and Anthony, "all pewter as is in the counter at Royden". To Elizabeth Sherman, wife of son Thomas, my velvet hood, etc. To Sybil Sherman, wife of son Francis, a damask kirtle, velvet hat and a grograine kirtle with a guard of velvet." To Marie Sherman, wife of son Anthony, a worsted gown guarded with velvet,"said Anthony paying unto James Sherman 1ss.3d. in consideration of the same. 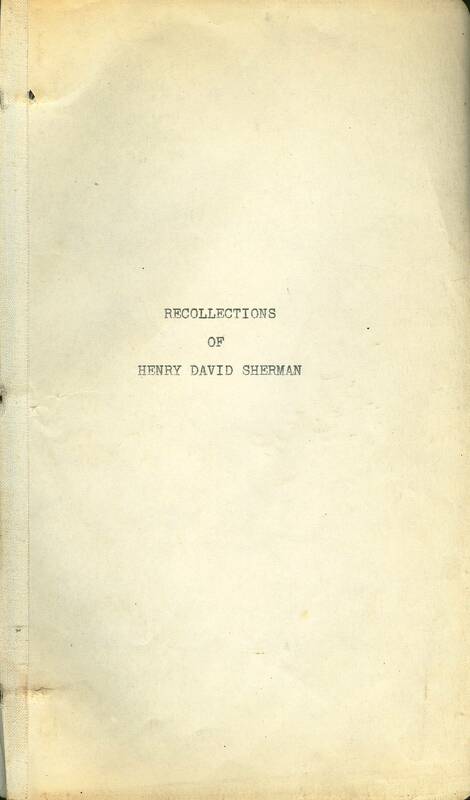 To Margery Sherman, wife of son, James; to the wife of Bartholomew Sherman and to Elizabeth Sherman, wife of son John, various articles of clothing. To Thomas Sherman, son of my eldest son Thomas, and to Elizabeth Sherman, daughter of my son Thomas, 20s. each at the age of twenty years. utors. (executors) If said Thomas refuse, then son Francis Sherman in his place. IV. 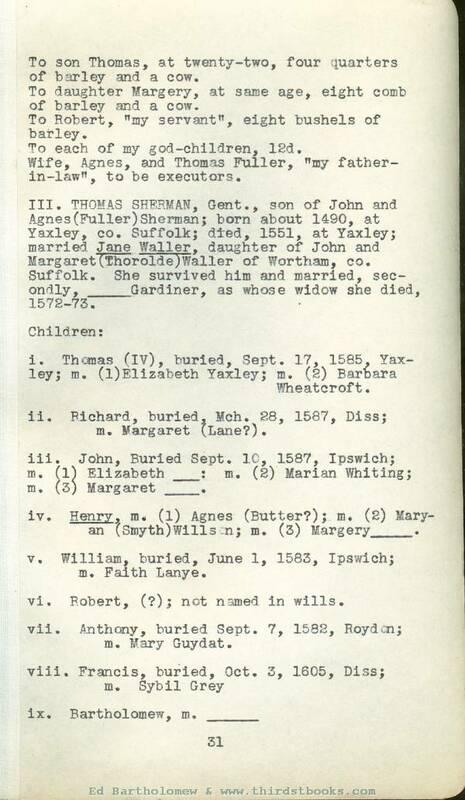 HENRY SHERMAN, son of Thomas and Jane (Waller) Sherman; born, about 152O, at Yaxley, co. Suffolk; died, 1590, at Dedham, co. Essex; married, first, Agnes Butter, who was buried Oct. 14, 1580, at Dedham; married, secondly, June 5, 1581, at Dedham, Maryan (Smith) Willson, widow of Edmund Willson; and married, thirdly, Margery ___, who survived him. i. Henry, m. Susan Lawrence, June 14, 1568.
ii. Edmund (v), buried Dec. 22, 1600, Dedham; m. (l) Anne Pellate, Apr. 25, 1569; m. (2) Anne Clere, Sept. 11, 1584.
iii. John, buried, Oct. 16, 1576. His will, 1576, names Brother Robert, and bros.-in- law, William Pettyfyeld and Nycollas Fynce. iv. Judith, buried, Apr. 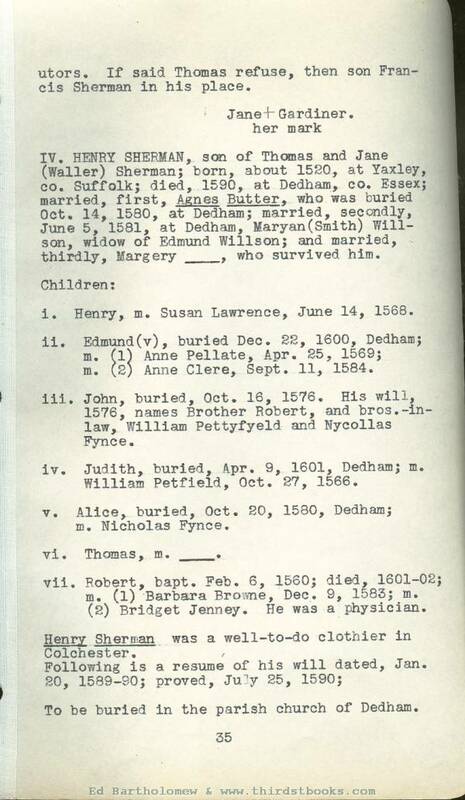 9, 1601, Dedham; m. William Petfield, Oct. 27, 1566.
v. Alice, buried, Oct. 2O, 1580, Dedham; m. Nicholas Fynce. vii. Robert, bapt. Feb. 6, 1560; died, 1601-O2; m. (1) Barbara Browne, Dec. 9, 1583; m. (2) Bridget Jenney. He was a physician. Henry Sherman was a well-to-do clothier in Colchester.